Praised for his “rich baritone” and for singing with “power, insight, and flawless delivery,” Baritone Matt Hanscom is enjoying success across the continent. To begin the 2017-2018 season he was Escamillo in Carmen with the Spokane Symphony followed by de Brétigny in Manon for Opera Santa Barbara. During the 2016-2017 season he was heard as Enrico in Lucia di Lammermoor, Figaro in Il barbiere di Siviglia, and Marcello in La Boheme all with Opera San Jose. He joined the Berkeley Community Chorus and Orchestra for Mozart’s Requiem, the Sacramento Choral Society and Orchestra for Home for the Holidays, and performed in the West Coast premiere of Kevin Puts’ Pulitzer Prize winning Silent Night. 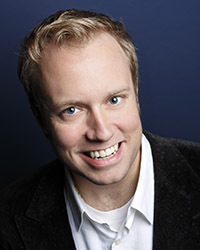 Possessing both bachelor’s and master’s degrees in music from Northwestern University, Matt is an alumnus of many of the nation’s premier training programs including Wolf Trap Opera’s Filene Young Artist Program, the Santa Fe Opera, the Merola Opera Program and Opera Theatre of St. Louis’ Gerdine Young Artist Program.